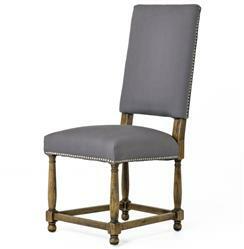 Sit back and relax in this handsomely upholstered high back dining chair. The rich, 100% Aspen grey cotton seat surrounds your guests in comfort. Both modern and classic, these chairs add a warm welcome in a dining or living room.